Many people assume that the origins of Hillsong originated from Charismaticism, Pentecostalism or the Salvation Army. This is not true. Hillsong’s roots were founded in the Canadian New Order of the Latter Rain (NOLR) cult. Today, this is internationally recognised as the New Apostolic Reformation cult. This series of articles looks at the history of the New Order of the Latter Rain (NOLR) and how it overran the AOG in NZ, the AOG in Australia and how this was done through Frank Houston, the founder of Hillsong/Christian Life Center. In this article we will explore how Frank Houston climbed the ranks of the NZ AOG and how he influenced and changed the Pentecostal ecclesiastical structures of the AOG and Australia to the totalitarian NOLR leadership structure. You will notice many of these ideas present in Hillsong and the Australian Christian Churches model. In our first article, we mentioned the fact that in the beginnings of the New Order of the Latter Rain (NOLR), they attempted to take over Pentecostal churches and fellowships in Canada. The NOLR have never stopped their aggressive campaign to take Pentecostal denominations in their attempt to spread their Gospel of the Kingdom. Remember – according to the NOLR and NAR, there is dead or religious Christianity and then there is a living or true Christianity. They believe Christianity before them preaches a dead gospel but they claim to preach a living gospel. Their Gospel of the Kingdom proves God is alive by having their gospel message itself manifest signs, wonders, healings and miracles. This means one is recognised as a leader, apostle or prophet of the Latter Rain if they demonstrate in power, this NOLR/NAR ‘Gospel of the Kingdom’. They have the ability to prophesy, bring miracles, healings and supernatural signs and wonders into gatherings or manifest answers, abundance or material wealth for the benefit of the advancement of the Kingdom of God here on earth. In New Zealand, the NOLR was clearly in full swing, usurping the Pentecostal denominations through the New Zealand AOG. It was an easy target considering how lax their ordination methods were. 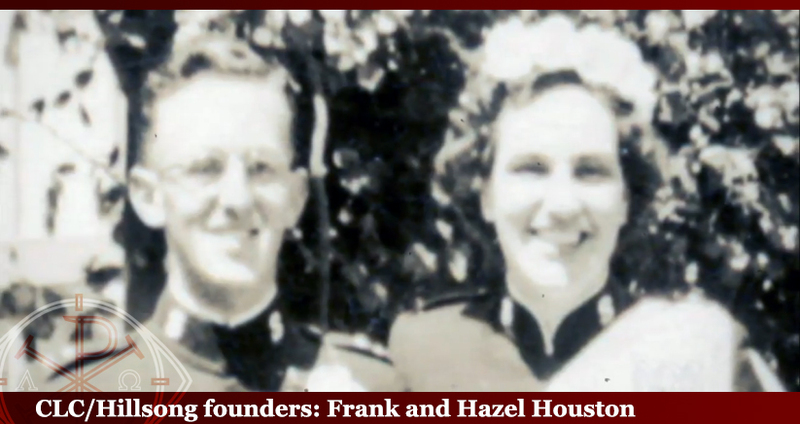 Hazel Houston records how Frank Houston became the Superintendent of the entire New Zealand Assemblies of God. “After the service Ray put his arms round Frank. ‘You’ll do. I would like you to be my associate pastor.’ When Ray made this unorthodox approach Frank asked what he had to sign. Ray smiled. He never did sign anything but on the spot he became an Assemblies of God minister. This was eventually ratified by the Executive Council, and two years later they discovered he was not even a member of the Assemblies of God. Frank often said a piece of paper didn’t make a minister, although he does not recommend this unorthodox approach.” pg. 76-77, Being Frank. “The umbilical cord was broken. As Frank put the letter down he glanced out the lounge room window. The sun was shining on a field of ripe cocksfoot grass. Suddenly it appeared to be blown by a gentle breeze. Every seed head seemed to turn into a human being. ‘I saw a multitude of people praising God,’ he told me. Like a deep inner prophecy, God said: ‘I will cause you to raise up an evangelistic centre in Lower Hutt that will finally have an outreach to the world. “Christmas already broke into an already busy schedule. For the first time, Frank had decided we should go to the annual Christmas camp and national business conference. The business sessions, held in the afternoons, were enough to deter any newcomer. Pastors sat with a copy of the constitution on their knees and their tongues ready to argue irrelevant points. For five days the delegates wrangled over, what Frank decided, was inconsequential to the lives of people. Why did this happen? How did this happen? The only thing that proved his legitimacy at this point was his associations with Ray Bloomfield and David Batterham and that he received Bloomfield’s mantle of “double portion”. The only thing that seemed to qualify Frank was his “supernatural” power and the church growth numbers. All Ray Bloomfield did was put his hands on Houston and sweep him in AOG’s backdoor without anyone knowing what Frank Houston actually believed. However, this is the way a prophet and apostle are recognised and established in the NOLR/New Apostolic Reformation (NAR) cult. Think of William Branham. And more recently, think of Todd Bentley of the man-made, Lakeland “revival”. Bentley automatically qualified as an “Apostle” by the NOLR/NAR because he was supposedly used by God to bring revival and was operating in healing, signs and wonders. It is our opinion that electing a Branham-man like into the NZ AOG was inevitable. The Latter Rainers in the New Zealand AOG would not have considered the policies, regulations, rules nor bother looking at the credentials of Frank Houston. They would have elected him because of his “prophetic” William Branham-like ministry and qualities. The Latter Rain was HUGE in pushing “intimacy” in God and freedom in their worship experiences. 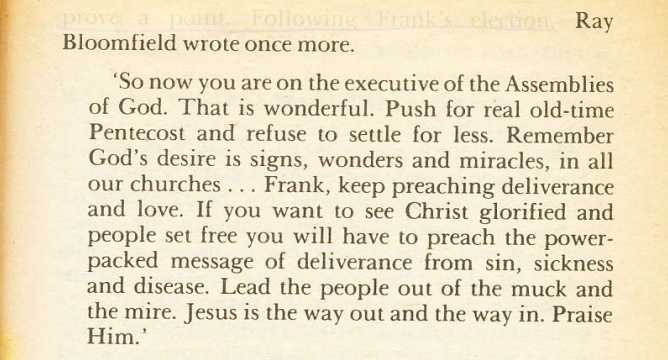 Jack Hayford, a NOLR and NAR leader, was also trying to reform and restore the global church into TRUE “freedom in praise and worship” (see his latter work ‘Worship His Majesty’, 1987). It is possible to claim that Frank Houston was “Apostollically Reforming” the New Zealand AOG to the “New Thing” God was doing on the earth. “So I believe that we’ll take God’s Word as the Rule and to go into all the world and preach the gospel. The gospel came not in word only but through power and demonstration of the Holy Spirit. So the gospel is demonstrating the power of the Holy Spirit. I went into nations where they say, “Now we don’t want missionaries. We know more about it than you do. But the thing we want to see is somebody who’s got faith enough to make God’s Word manifest.” That’s what they want to see. This is not Pentecostalism. Here we can see Ray Bloomfield pushing the NOLR agenda through Frank Houston to newly reform the New Zealand AOG. In response to Ray Bloomfield’s letter, Hazel writes. “Sometimes Frank wondered if the movement could revive. Yet when pastors of independent churches tried to persuade him to also go independent, the awareness that God had some special purpose for the Assemblies of God kept him where he was. The antagonism towards these independent groups by some of his fellow ministers left Frank puzzled. Notice Frank wanted the AOG movement revived and saw that the answer to revival was founded in unity, not division. And also notice his dig at some ministers for being “not even Christian”. 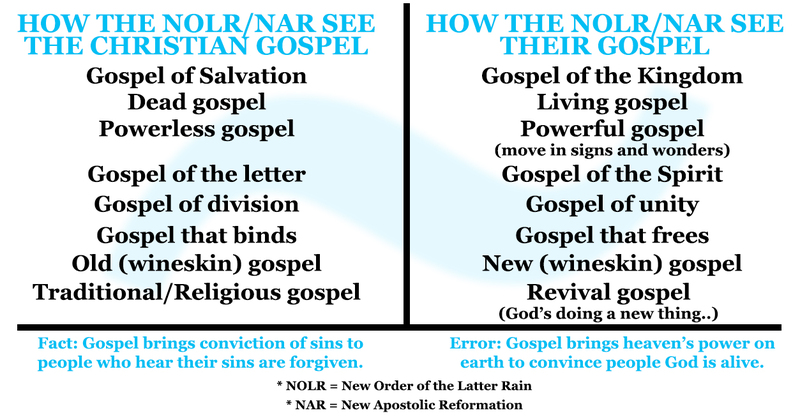 This is the typical Latter Rain revival paradigm where unity is emphasised over doctrine. You are either spiritually on board with what God is doing or religiously dead and getting in the way. Don’t forget that there were heretical sects emerging from the Pentecostal churches such as Oneness Pentecostalism (who deny the trinity) and extreme Full Gospel/Foursquare sects. Notice the emphasis on ‘vision’. Houston claims to the board, “I’ve been asking God for direction and I feel we must take the town hall for a crusade” (pg. 115). Now he is prophetically dictating what needs to be done. He is now putting the hat of a governing Latter Rain Prophet on himself in the NZ AOG. This is frightening insight into how NOLR Prophet Frank Houston manipulated the board to agree with his “vision” from God. And this is exactly how the Hillsong church and the Australian AOG operate to this day: you don’t question the Apostle, Prophet or leaders vision. And when Prophet Frank Houston found a building he liked, how did he present his idea to the board members? Why would the board members question him? We hope you can start to see the New Order of the Latter Rain manifest itself through the authoritarian methods of Frank Houston at this point. Who can question God wanting Frank and the board to buy this church? “Frank phoned the mayor on Monday. ‘We’ll take the church,’ he said. ‘You had better make an appointment to come see me,’ the mayor said. He was an astute businessman. ‘It will cost you $60,000. Do you have that much money?’ the mayor asked. ‘Yes of course we do.’ Frank didn’t tell him it was still in the bank of Heaven. He believed God had shown him the city council would carry the finance themselves.” pg. 120-121. We will look more into this scandal in another article. However, this is the god of Frank Houston and the New Order of the Latter Rain. This was the aura Frank Houston created around himself in the New Zealand and Australian AOG. The NOLR “Prophets” and “Apostles” were climbing the ranks and swiftly destroying and redefining the Pentecostal institutions and churches of Australia and New Zealand with their totalitarian spiritual regimes. “The executive council was not a body of men who agreed on everything, but they were in agreement when they needed a new superintendent. Ralph Read, the current superintendent, had accepted a call to a church in Australia. He was a gifted organiser who had given strong leadership to the movement in New Zealand. The Lower Hutt church wondered anxiously who could replace him. Our board offered to pay his salary if he’d stay as superintendent in a full-time capacity. Ralph felt that would be out of the will of God. Frank, now assistant superintendent, found himself elevated to the position. Neither of us wanted that. There was already so much to do in the ministry but we yielded to what was assuredly the purpose of God. We knelt in dedication while Ralph Read prayed for us with laying on of hands. Both of us were aware of a special sense of God’s calling into a phase of ministry which would release the fellowship into a period of growth. “The ministry in New Zealand was suffering from a lack of trained people. It would also be part of the vision to reach the world. The aim of the college would be to train young people to evangelise the world. Academic excellence would be important but secondary to the development of their spiritual lives. No way must the fire of the Spirit be doused, although education must not be despised. Students came from Samoa, Fiji, Indonesia, Australia and Sri Lanka. ‘These are your spiritual sons,’ the Spirit whispered. We want to make it clear. We are not against goals and accomplishments being achieved in the name of Jesus. The issue is that people blur the lines and claim that God gave them a “vision” to achieve something, thus making themselves out to be infallible men. Frank Houston was clearly a man who controlled the New Zealand AOG as God’s vision-seeing prophet and restructured it accordingly so that he was accountable to none. That is incredibly dangerous. It is clear Frank Houston considered himself to be above church boards and various forms of governing AOG and church infrastructure. And what is concerning is how the AOG executive board and his own church board seem to be more than willing to submit to his prophetic direction. If you think we have come to serious erroneous conclusions of Frank Houston and his relation to any form of accountability structures in the AOG because of his prophetic delusions, we would please ask you to consider the articles that are still to come in this series.